Until July 2012, Matt Missen had spent around 18 years working as an Architect with various companies both in Australia and overseas. Matt’s architecture experience included cultural, retail, hospitality, commercial and residential projects in Victoria and Western Australia as well as many cities in mainland China. Matt getting stuck into some Northcote clay. Since September 2012, Matt has been working as a gardener and garden designer with a little bit of architecture thrown in for good measure. Having grown up in the country (near Beechworth in North East Victoria), Matt is familiar with plants, trees, gardens, irrigation systems and general land management practices. His architecture experience gives him a good understanding of space, structures and the interaction between people, the environment, their gardens and their indoor / outdoor living spaces. 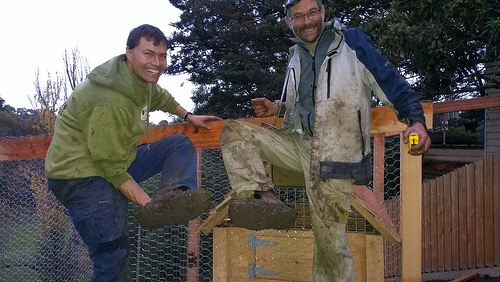 VEG Landscaping mainstays Will Pullin (aka Will Power) & Matt (aka The Missen Link) showing off their mud-caked boots after a day working in the rain in Alphington. Takes more that a bit of rain and mud to dampen the spirits of these two! 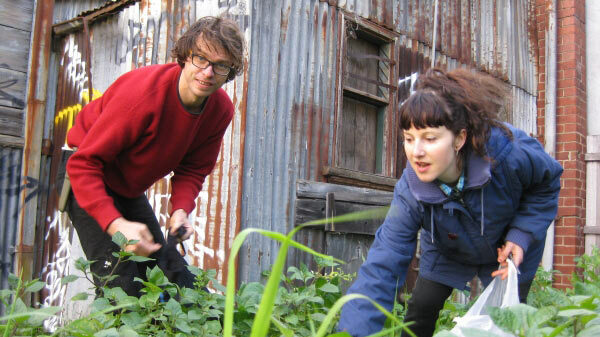 Working with VEG for over a year now, Matt has assisted in the construction of chook yards, vegie beds, pergolas, orchard enclosures, retaining walls and great outdoor spaces all around Melbourne. Working closely with the other members of the VEG management, design, warehouse and implementation team, Matt has increased his knowledge of these areas as well as helping other members of VEG to better understand design principles, and detailing and construction techniques on site. 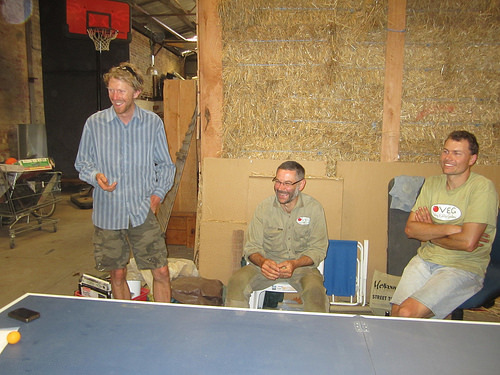 Matt flanked by Carey and Will at the 2013 VEG team ping pong championships. 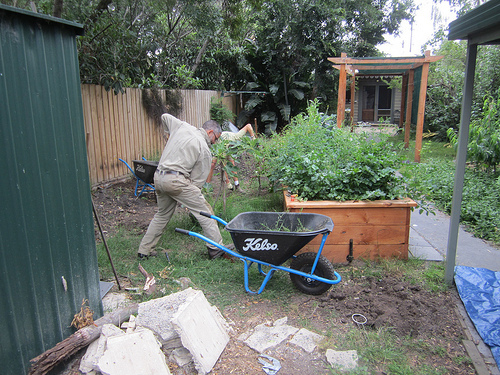 In addition to working for VEG, Matt does general garden construction, landscaping and architecture work (he designs and builds a particularly mean pergola, but can design whole houses and renovations etc too). Feel very free to email him direct if you know someone who might benefit from his – (the closer to Box Hill the better). We’re delighted to have someone of Matt’s calibre as part of VEG, and we are hoping that over time his professionalism and attention to detail will rub off on the rest of us ;-). He also has a superb ute (which has created a bit of ute envy in the ranks) and cage trailer which has saved the day on many an occasion and which greatly enlarges our capacity to bite off more than we could previously chew! Thanks Matt and don’t go anywhere.